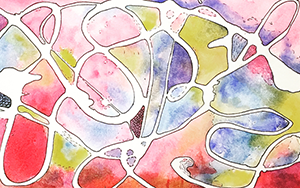 Students attending one 4-week session will learn four watercolor techniques and basic color theory while working with a limited watercolor palette. For the best experience, Instructor Leslie McCrea recommends attending 12 weeks of classes to fully complete the beginner curriculum that she has created but is sure those who can only attend one or two 4-week sessions will have a satisfying experience. Classes fill quickly. To guarantee your spot, signup for one, two or three 4-week sessions (or more) at a time. Those who complete 12 consecutive weeks of class will have the opportunity to turn their pages into a colorful circular book to be used for reference in painting future watercolors. Students label techniques, add notes, inspirational quotes and sketches to complete their book. *$10 additional materials fee applies to book-binding and is payable when you attend a book-binding class. *coursework is designed and created by Jana Bussanich Art Studio. No experience needed. All levels and ages welcome. Recommended for ages 12 years and older.